Looks like we're going to have to wait a little longer before we get to kill some more zombies. If you've been waiting for Dead Rising 2 with baited breath, then Capcom has some bad news for you. The game's release date has been pushed back by nearly a month, though no reason for the delay has been revealed. Capcom confirmed that the game will be released in North America a few days before it is in Europe. Here in the States, gamers will be able to buy the game on September 28th, while our European brethren will have access to it come October 1st. Originally, Dead Rising 2 was due out on August 31. 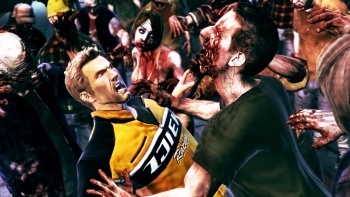 Dead Rising 2 will be released on PC, PS3, and Xbox 360. The game looks like it's going to be a blast, featuring even more zombie-killing goodness than the original, as well as being a bit more user-friendly (like allowing for more than one save game at a time). Check out Susan Arendt's E3 video interview with Mike Schmidt for more details. If, however, you need a more immediate zombie fix, take heart and remember that Capcom is releasing a Dead Rising movie this summer.